Beyene Russom Challenges Kenyan Government with proof | .:TesfaNews:. 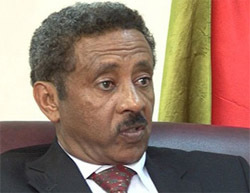 The Eritrean embassy in Nairobi says Asmara is not opposed to Kenya’s offensive in Somalia and is challenging anyone with evidence that its government is arming Al Shabaab militants to go public with it. Ambassador Beyene Russom told Capital Newsbeat in an exclusive interview that his country has never been involved in the internal affairs of Somalia and cannot therefore arm Al Shabaab in any way.